Angry construction workers here punished a BMW 3 Series for parking his car illegally on the side of the road, as reported by AllSingaporeStuff. The unhappy workers from a nearby construction site showed their displeasure by using three massive concrete blocks to trap the car from leaving. 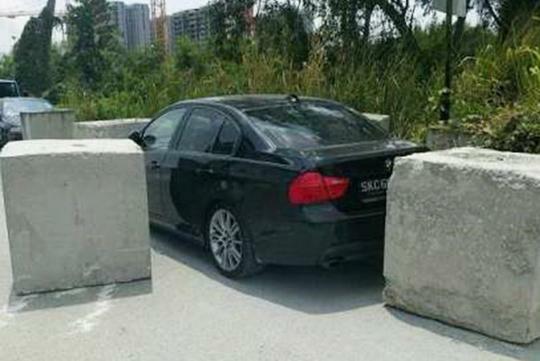 While the article did not mention how the car obstructed their work, the BMW driver had to resort to calling the police for help to shift the concrete blocks away from his car. So readers, before you park your car in that free parking area, make sure you don't inconvenience others! We need more concrete measures against illegal parking. Looks like the outside block damaged the road when they moved it there.